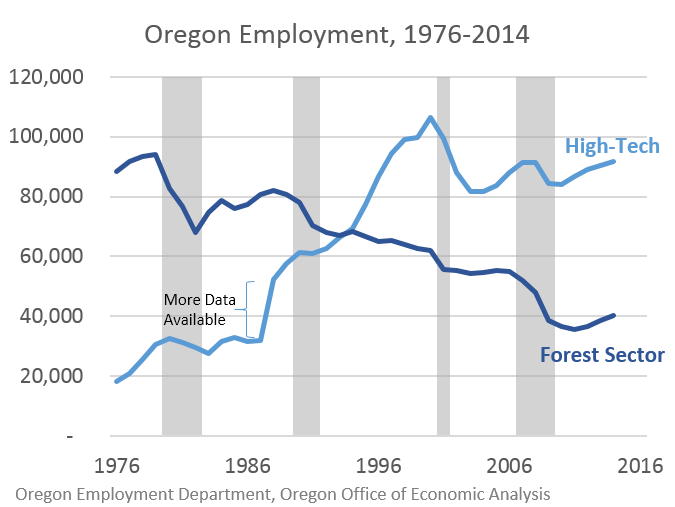 Oregon remains a natural resource and manufacturing state, which along with our strong migration patterns, are really the two distinctive features that sets the state apart from most others. However the nature of our goods producing industries has changed over the past 40 years. Previously our office has detailed historical trends in both the wood products industry and the high-technology industry. What follows below the fold is a short summary from our latest economic and revenue forecast of how these longer-run trends have effectively offset one another from a top line, statewide perspective. Of course, at a regional level these trends are not offsetting as the geographic footprint and impact of the industries is not the same. When you have plenty of food on the table, it’s easy for us in America to decide we want to avoid certain foods. I mean, lots of us may avoid things like Brussels sprouts or squid, for example. But there is a growing trend to cast certain categories of food or food ingredients out of our diets for a variety of reasons – weight loss being number one since just about any diet tends to cut out certain food segments. There are also a good percentage of people with serious food allergies or intolerances to things like shellfish, peanuts, gluten, lactose, sulfides or even strawberries that need to avoid them. But there is a significant amount of the population that experts say are increasingly developing an unjustified fear of certain food ingredients, particularly genetically modified organisms (GMOs). However, Just has done research that shows what happens once consumers understand the reasons for genetic modification. “When consumers are presented with direct explanations of the direct benefits they are much more willing to accept the technology,” said Just. 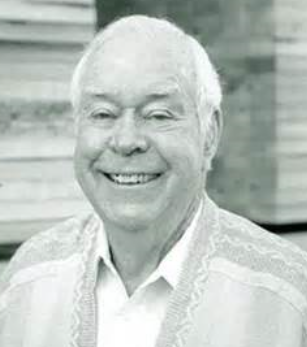 Aaron Jones, founder of Seneca Sawmills, died this week and leaving behind an extraordinary legacy of innovation, giving and efforts to help others. Jones served his country in WWI and came back to later start his first timber company in 1953. Aaron grew it a company that now hires over 400 people and is one of the largest-producing timber & sawmill single-site mill in the America. Like Steve Jobs or Henry Ford, Aaron’s ingenuities helped make his mills honored around the world for their innovation. Those successful mills helped employ hundreds of families & the resulting timber revenue brought millions in funding for local schools helping several generations of Oregon kids learn better, read better and achieve better because of his mills in operation. Invasive species, such as nutria and Japanese knotweed, pose a major threat to native habitats, costing the U.S. an estimated $120 billion annually. One way to beat them is by eating them! Promoting this idea is the “Eradication by Mastication” event. The fundraiser, now in its second year, was created in response to a national movement of chefs who are experimenting with invasive species dishes. A cook-off competition, live and silent auctions, and buffet featuring fare made with invasive plant and animal species will take place from 2–7 p.m. on Sunday, Sept. 28 at Zenith Vineyard in Salem, Oregon. Tickets are $75. • For more information, visit the the event website at http://eradicationbymastication.org. U.S. Sen. Ron Wyden, D-Ore., today secured a commitment to mark up his O&C Act of 2014 in the Senate Energy and Natural Resources Committee on November 13. Energy Committee Chair Senator Mary Landrieu, D-La., issued an announcement Tuesday afternoon that she would hold a markup of a number of public lands bills, leading off with Senator Wyden’s O&C legislation. I’ve talked to dozens of people since we published our special report and video, State of Fire. They agree with the premise of the report: Wildfire risk in Oregon and the broader American West is growing, and to address it, we need to change the game plan. The trend is worrisome. Fire season is lasting longer, more people are living in or near the forest, and the condition of our dry forests is getting worse. What are the solutions? My conversations lead me to three, although I’m sure these just scratch the surface. The U.S. House of Representatives will vote this month on two pieces of legislation championed by Rep. Greg Walden (R-Hood River) that would reform federal forest policy and bring more water and power to Crook County for job creation. According to an article in this morning’s Bulletin, “Both of the Oregon-related bills passed the House in 2013, but have not been taken up by the Democrat-controlled Senate.” (read the full article below). “These bipartisan bills will help grow Oregon’s rural economy, improve forest health, prevent wildfire, and bring more water and power to Central Oregon for job creation. They have both passed the U.S. House previously with strong support, and the House will pass them again to underscore how important these bills are to Oregon. The U.S. Senate should pass them right away to bring much needed jobs to Oregon’s rural communities,” Walden said. Studs and logs remain unseasonably steady and strong. Home construction is up, but needs to continue its momentum. 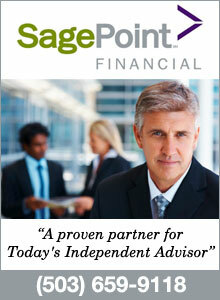 Mortgage interest rates remain attractive. Statistics from recent years for lumber manufacturing, home construction, and housing markets are compared to 2005. In the last 3 months, studs and logs have been very steady, and well ahead of a year ago, when there was a more typical summer slump. Mortgage interest rates continue to drop steadily, now 4.10% in the latest week, for a 30-year fixed-rate mortgage. Unsold inventories remain steady and low. Zillow’s home values index continues to rise fairly steadily. The House of Representatives passed H.R. 5078 Waters of the United States Regulatory Overreach Protection Act of 2014 in an attempt to halt the Environmental Protection Agency and the U.S. Army Corps of Engineers’ proposed “Waters of the United States” rule. The National Cattlemen’s Beef Association and the Public Lands Council applaud the efforts of Rep. Southerland (R-Fla.) to block what is described as the largest federal land grab to date. In 2014, Oregon wine grapes are harvesting early this year than normal. Watch the KGW-TV news clip below.